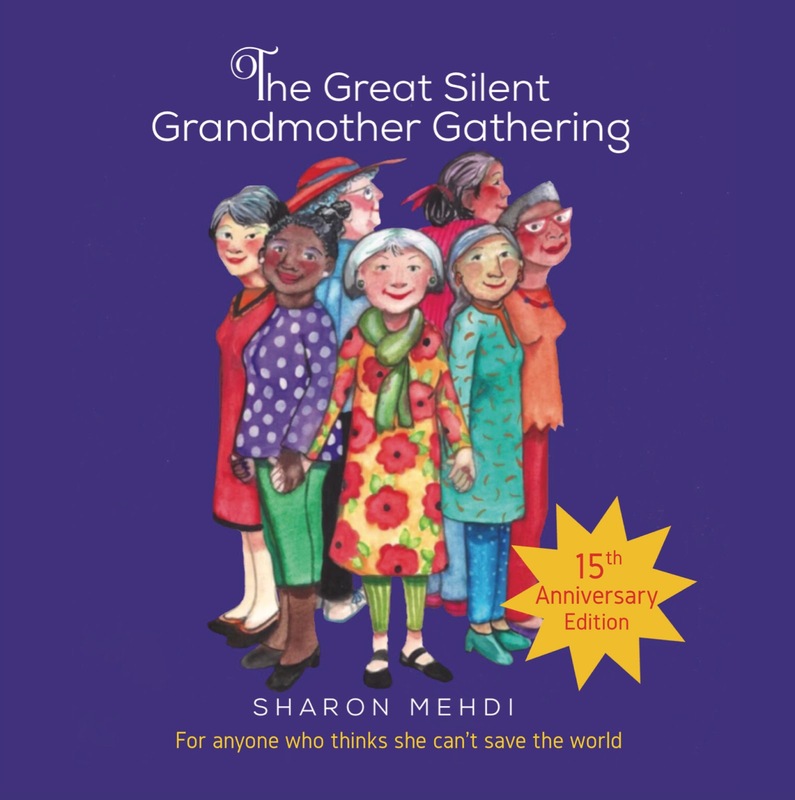 She told me she wrote a book, so I ordered it and, after I read A Curious Quest for Absolute Truth, my respect for this woman grew. Not only was she funny, but she could write, and express deeply felt things. 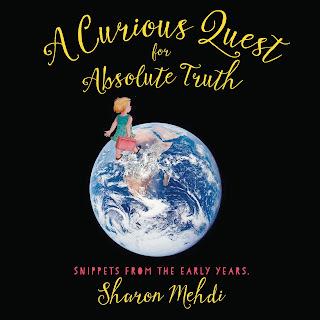 As the Board Member in charge of books and authors at Art Presence Art Center & Gallery in Jacksonville, I asked Sharon to read from Curious Quest several years ago. 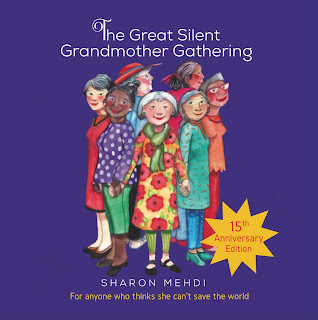 It was such a hit, we ask her back every year. Not only that, Lucky Valley Press (David & Ginna) helped Sharon re-publish A Curious Quest for Absolute Truth, as well as the Great Silent Grandmother Gathering and, my favorite, Eleanor Bobbin. I love to be read to. And she's so funny. 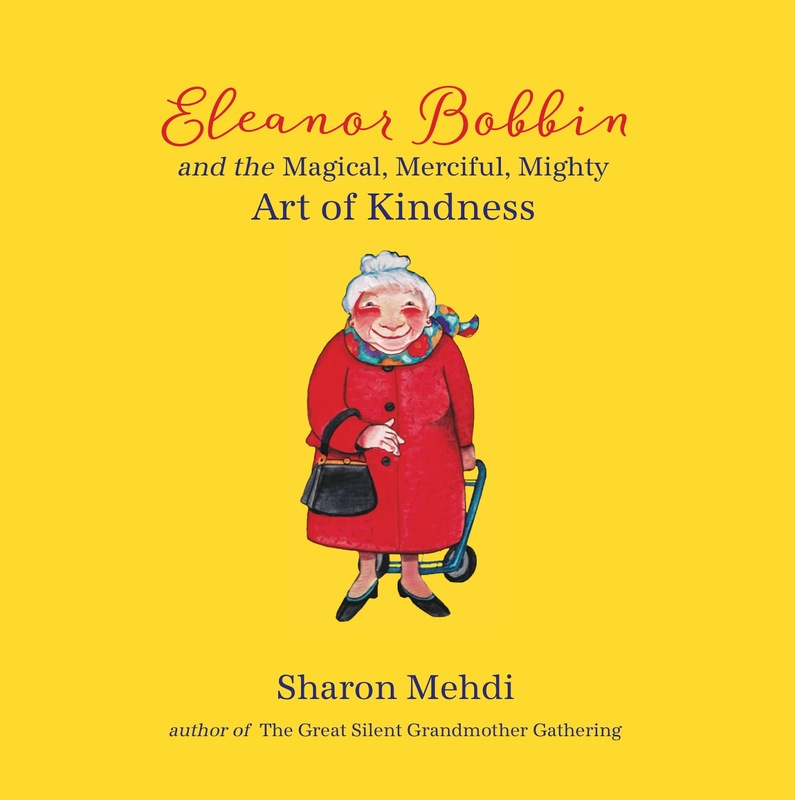 And, Eleanor Bobbin really does have the potential to save the world. 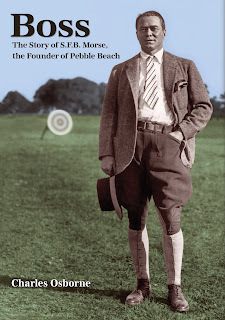 "As this book goes to print, the world is once again in chaos. Rancor and retribution rule the day. Greed, fear and demagoguery have been crowned Kings of All That Is. "And yet... and yet... hidden beneath the helplessness there is a glimmer of light. So faint it can be seen only in the darkest of dark night. "If this tiny flicker had a name, it might be called forgiveness, compassion, kindness or love. Such little words. But the one thing I know for sure is that they can create miracles. They can make the impossible possible. They can heal lives. And sometimes, whole communities. Just ask Eleanor Bobbin." around the world to remind them, Eleanor Bobbin is it. is worth it. She should be President. P.S. 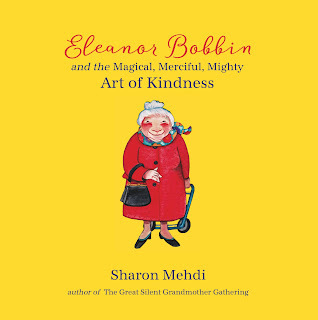 Eleanor Bobbin kindly includes an uplifting Apple Dumpling recipe. I am not well-set, nor do I have the bandwidth for, taking pictures of my hands while creating. 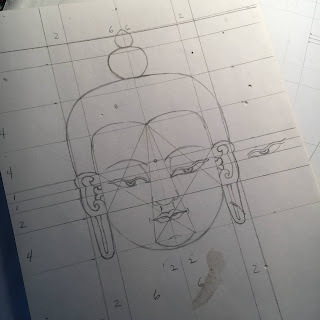 Following are all the photos of my Buddhas over the course of three days. All the facial features are exaggerated, not on purpose. The top not and hair aren't right proportionately and you can see from this side view, he has a flat face. This guy looks like a cross between a British peer (doesn't it resemble a powdered wig?) and Deepak Chopra. The bindi on his forehead helps the overall look. 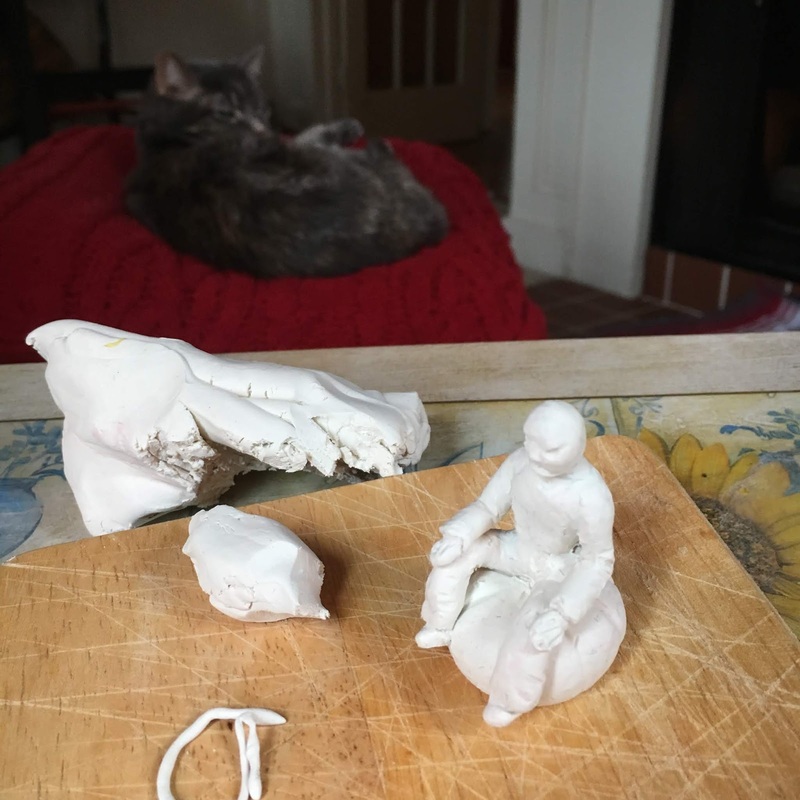 Last night's sculpture looks like Yul Brynner as Mongkut, King of Siam. 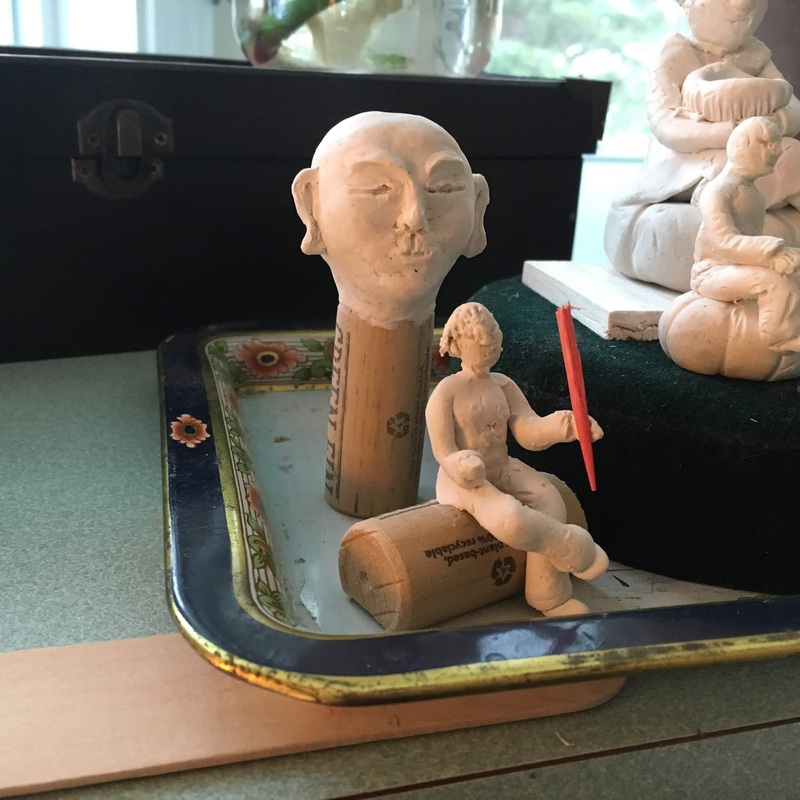 And my latest student still doesn't have much of a face, and without armature, she'll always have to be sitting down. The week's work. 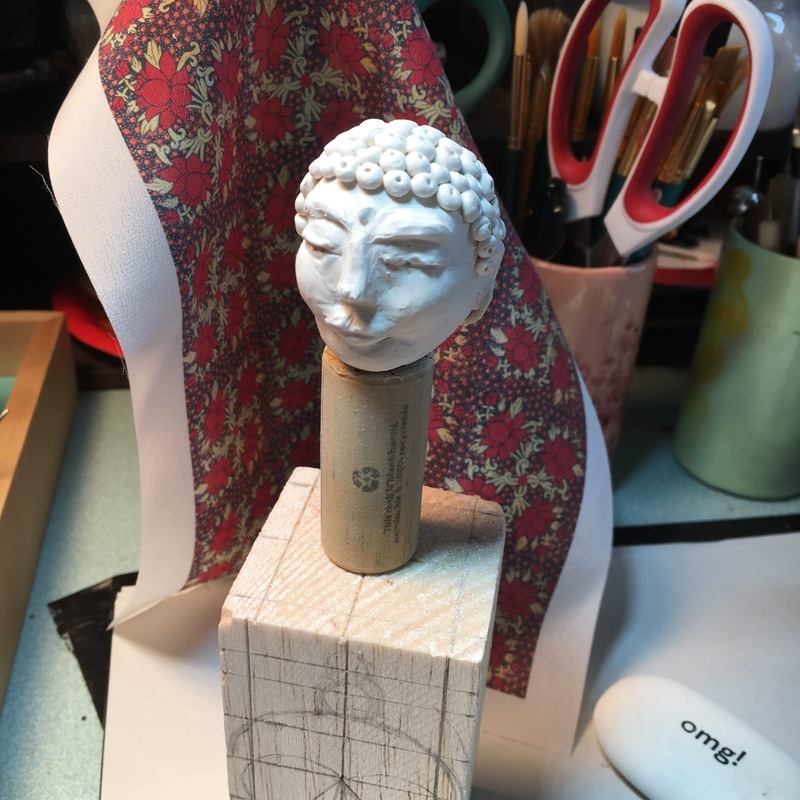 Self-imposed Polymer Sculpture Class 101. 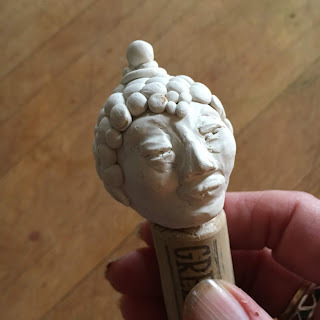 I stuck a quilter's straight pin into a cork for something to hold onto. I scrunched the foil head down over the pin with a dollop of hot glue. 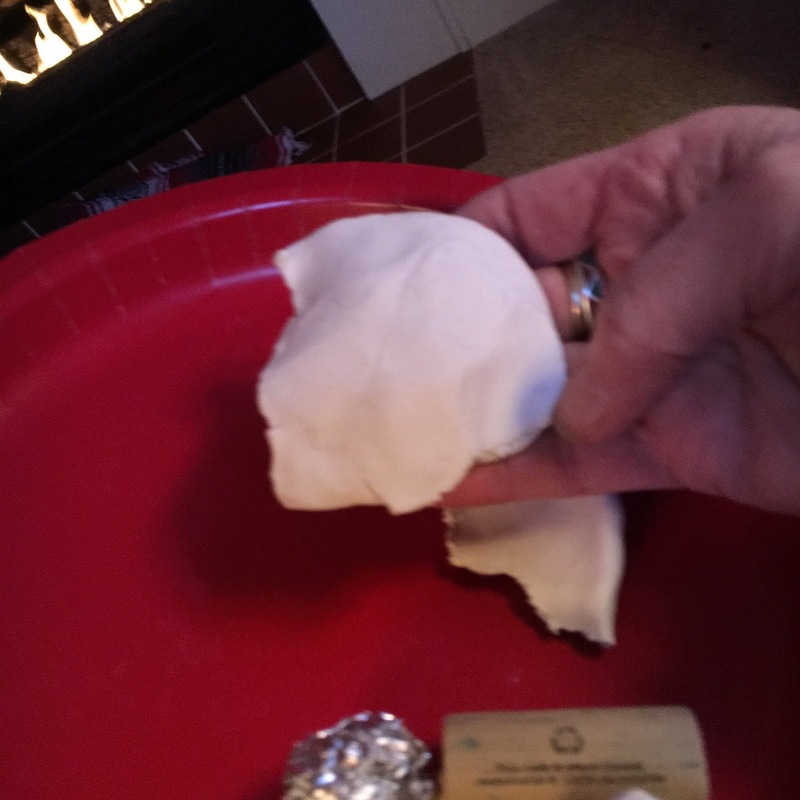 With a small ball of clay, I pressed out a disk to cover the foil and form a head, making it slightly oval in shape. 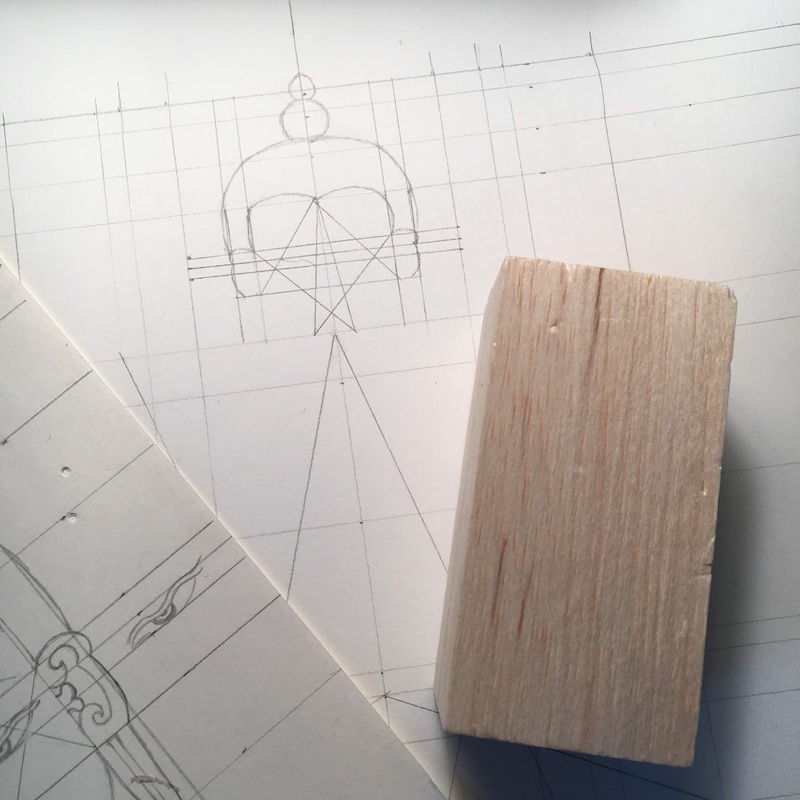 I marked the lines for eye, nose, lips and chin, and made about 24 little pieces for these additions. Polymer clay is so forgiving. After its warmed up (conditioned) it stay supple for a long time an can be worked over and over again before it is baked. 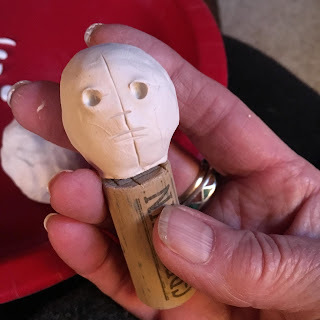 These eye sockets turned out to be a bit much. The instructions called for little clay eyeballs, but I toned them down with Tibetan slits for eyes. 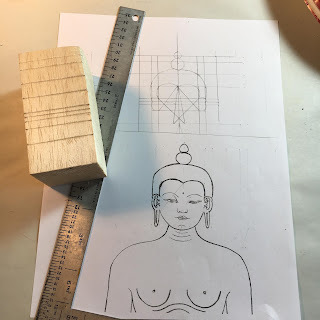 The facial features on my first Buddha turned out a little exaggerated; next time I'll make my tiny body part pieces tinier. Not bad for a rank beginner. 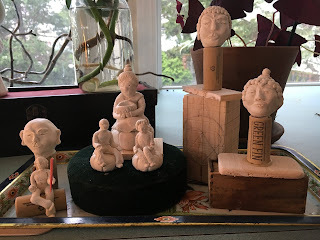 In typical DIY style, I took up the challenge of building my own Buddha for the Tibetan Shrine to the Divine. Ah, well, more of a dare, really. It was my girlfriend, Eunice. She said, "You're going to make it yourself, right?" I laughed. "No, no," I said. 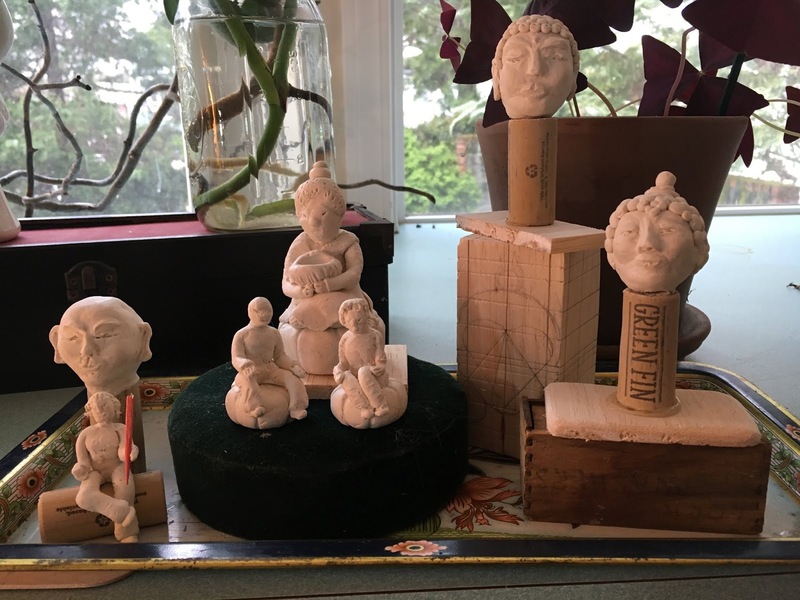 "I draw the line at sculpting a Buddha." Well. 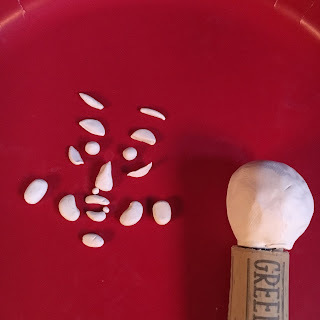 To the left here is my very first attempt at modeling polymer clay, beyond rolling balls and sticking holes in and calling them beads. Once again, I followed a YouTube video. 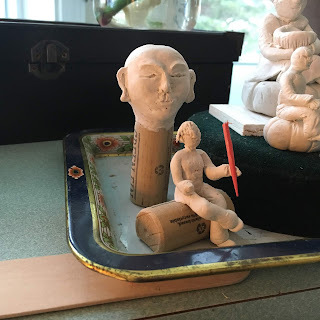 Everything here was made with little logs of clay - legs, arms, torso, head. I was pleasantly surprised. Although these two figures (the teacher and his student) have no discernible faces, they do have shapely bodies and good posture. If you get too close, the student looks like a cat and the teacher resembles a Martian from a 50s movie, but I like the wrinkled pants and the fat cushions on which they sit. 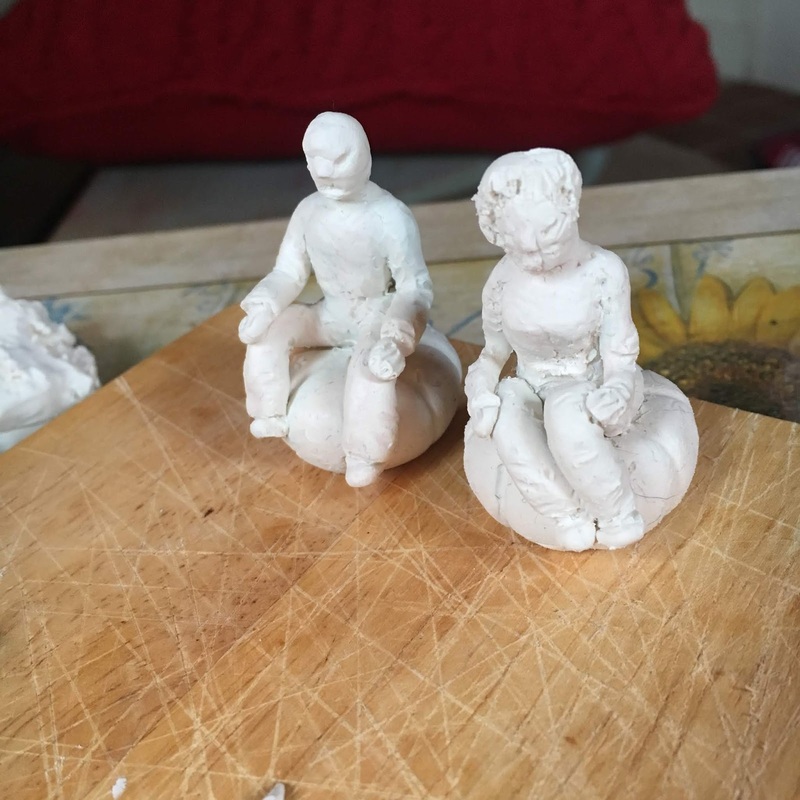 I modeled these two little figures while listening to an audio book in front of the fire. Everything I needed fit on a paper plate. 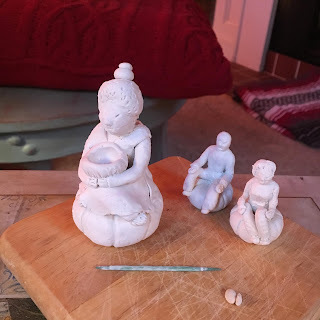 I have abandoned knitting until the fall, imagining spring is around the corner and soon I will be planting seeds, but meanwhile, why not teach myself to sculpt? 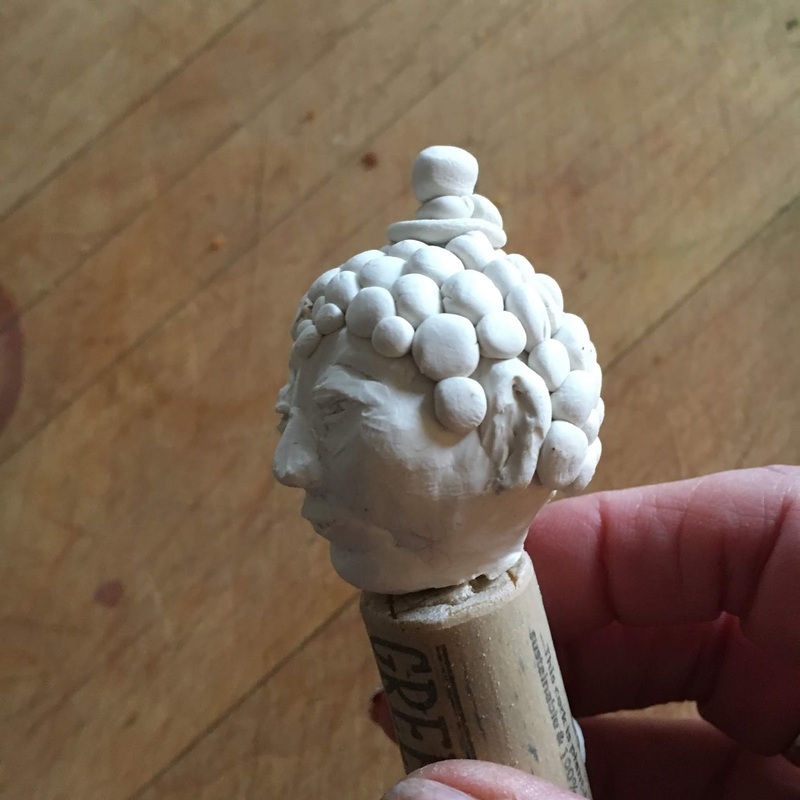 Now, Buddha here looks more like Caspar the Friendly Ghost with a bad Gibson Girl hair do. Holding an empty cereal bowl.